Cloud CMS provides business users direct control of any website content in a seamless fashion - allowing Developers to use popular frameworks such as Angular and Ember. Preview your site and apply changes with numerous templates / wizards. We'll handle any versioning and tagging, as well as deployment across stages. For a quick tour of these in action, checkout the video on this page or try for yourself by following any of the steps outlined below. A web project features additional user interface pages to help you manage pages, templates, URLs and other rendering elements for your web site. 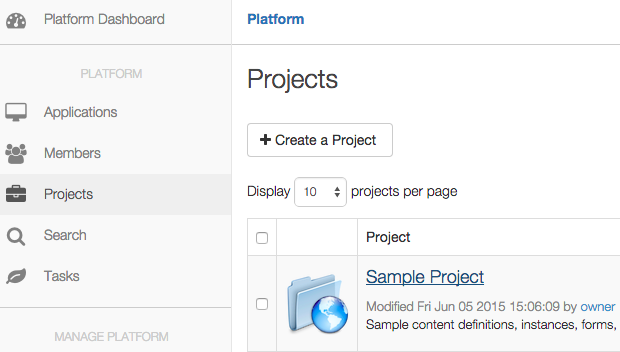 Web Projects come with additional content types for pages and templates. Create pages and use Dust.js templates to deliver cached and performance optimized renditions of your custom content types right to your end users. The Content tab lets you navigate your custom content types and create new instances using a simple and intuitive form interface. Content is created once and allocated to many different pages, processing through templates to rendition in different formats. View existing content items with instant preview right inside of your web browser. Forms make it easy to make adjustments and push those adjustments live to your web site. As you make changes, view them instantly on the live web site. Or utilize workspaces to make changes in a separate branch so as not to affect the project. Preview changes instantly and approve them for merge back into the project. The Cloud CMS Application Server calculates a dependency-based cache which allows tag processing to be cached and invalidated as changes are made within the Cloud CMS user interface. HTTP Headers are automatically managed for Amazon CloudFront CDN. 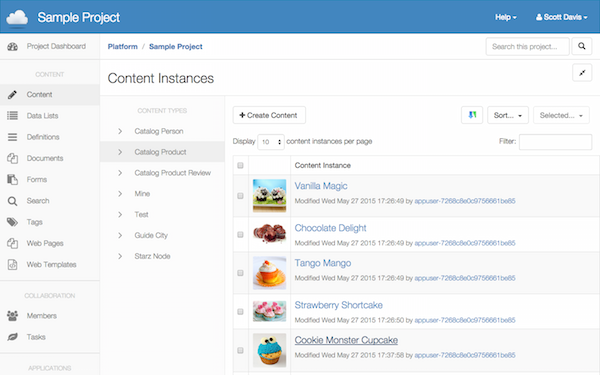 Publish content using workflow to collaborate and move content across your test, QA, staging and production web sites and application servers. Customizable content models including type, association and property definitions with inheritance, relationships and schema-level validation. Safely capture all of your work with automatic Git-like changeset versioning. Rollback to any moment in time or schedule future workset deployments. Work efficiently and securely in parallel streams of development, either privately or within teams, using Cloud CMS branching, diffing and merging. Define content entry forms and wizards using JSON Schema and a visual form designer. 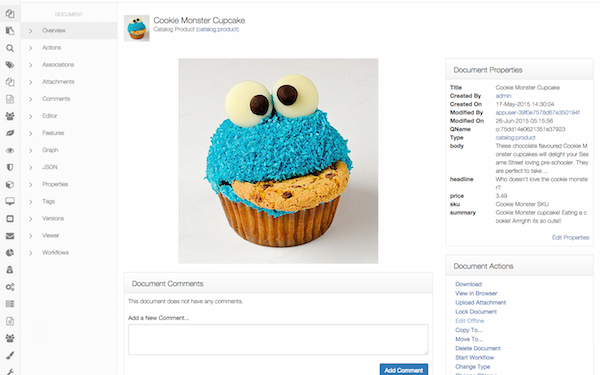 Assign forms to content workers based on user roles to make life easier. Deploy your Cloud CMS powered applications from GitHub to Cloud CMS application servers or push to Elastic Beanstalk, Heroku or Engine Yard. Make changes to your content and instantly preview to see how things look for web applications running on desktop, tablet or smart phone. Organize your projects and business users into teams to easily delegate roles and access rights, letting people work together seamlessly. Define your business processes for managing the lifecycle and approval of content, spanning your team members, multiple tasks and interactive forms.